This program applies a noise filter to a cube. Pixel values that are considered to be noise will be replaced with either the average of the boxcar or the Isis NULL value. 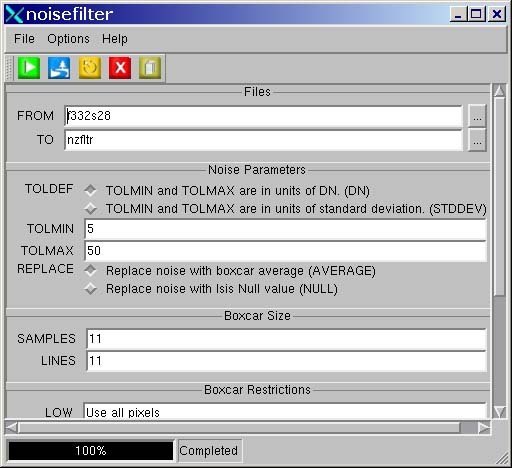 The criteria for determining whether a pixel is noise or not is given by the TOLMIN and TOLMAX parameters. If the difference between the input pixel and the average of the boxcar is greater than the tolerance given, the pixel is considered to be noise and is replaced. If the STDDEV option is chosen, then TOLMIN and TOLMAX indicate the tolerance in number of standard deviations between the input pixel and the boxcar average that determines whether the pixel is noise. The number of pixels replaced and the corresponding percentage is output. K Teal Thompson 2003-04-10 Add example. Stuart Sides 2003-05-16 Modified schema location from astogeology... to isis.astrogeology..."
Jeff Anderson 2003-08-25 Separated standard deviation and average noise filter options into two routines. Fixed problem filtering special pixels. Modified explanations for TOLMIN and TOLMAX. If DN is chosen TOLMIN and TOLMAX are in dn units. If STDDEV is chosen, TOLMIN and TOLMAX are number of standard deviations. DN TOLMIN and TOLMAX are in units of DN. If the difference between the input pixel and the boxcar average is greater then the tolerances given in TOLMIN or TOLMAX (values of DN), the pixel is considered to be noise and will be replaced. See TOLMIN and TOLMAX for more details. STDDEV TOLMIN and TOLMAX are in units of standard deviation. If the difference between the input pixel and the boxcar average is greater than the number of standard deviations indicated in TOLMIN or TOLMAX, the pixel is considered to be noise and will be replaced. See TOLMIN and TOLMAX for more details. Minimum tolerance value used in the STDDEV filter. If the difference between the original pixel, and the average value of the noise filter is less than the FLATTOL then the output pixel will remain unchanged from the input pixel. Without this safeguard, very uniform inage areas (low standard deviation) will be excessively smoothed, creating areas of constant DN. If you are attempting to remove black speckle or other dark noise then you should be modifying this parameter. When a pixel is being checked for noise, a difference between the pixel and boxcar average is computed. If this difference is negative then TOLMIN will be used to determine if we have noise, hence dark noise will be removed by modifying TOLMIN. For the DN option, if the absolute value of the difference (pixel - average) is less than TOLMIN, then the input pixel is preserved. Otherwise it is considered noisy and will be replaced. For the STDDEV option, if the absolute value of the difference is less than TOLMIN * standard deviation of the boxcar then the input pixel is preserved. Otherwise it is considered noisy and will be replaced. In general, a high tolerance means fewer pixels will be replaced and lower tolerance will cause more pixels to be replaced. Too small of a tolerance can actually replace real/good data. For the STDDEV option, you might try TOLMIN=3 as a starting point. For the DN option, try TOLMIN=2. If you are attempting to remove white speckle or other bright noise then you should be modifying this parameter. When a pixel is being checked for noise, a difference between the pixel and boxcar average is computed. If this difference is positive then TOLMAX will be used to determine if we have noise, hence white noise will be removed by modifying TOLMAX. For the DN option, if the difference (pixel - average) is less than TOLMAX, then the input pixel is preserved. Otherwise it is considered noisy and will be replaced. For the STDDEV option, if the difference is less than TOLMAX * standard deviation of the boxcar then the input pixel is preserved. Otherwise it is considered noisy and will be replaced. In general, a high tolerance means fewer pixels will be replaced and lower tolerance will cause more pixels to be replaced. Too small of a tolerance can actually replace real/good data. For the STDDEV option, you might try TOLMAX=3 as a starting point. For the DN option, try TOLMAX=2. This is the value that is used to replace pixels which are considered to be noise. AVERAGE Replace noise with boxcar average If the input pixel is considered as noise, it is replaced with the average value of the boxcar. NULL Replace noise with Isis Null value If the input pixel is considered noise, it is replaced with the Isis Null value. This is the total number of samples in the boxcar. It must be odd and can not exceed twice the number of samples in the cube. In general, the size of the boxcar does not cause the program to operate significantly slower. The shape of the filter can be used to control types of noise to remove. For example, a 3x3 or 5x5 boxcar can be used to remove speckle or salt and pepper noise. A 1 sample x 5 line boxcar with REPLACE=NULL could be used to remove dropped or noisy lines of data. Then use the lowpass program with a 3x3 boxcar to fill in the NULLed data. This is the total number of lines in the boxcar. It must be odd and can not exceed twice the number of lines in the cube. In general, the size of the boxcar does not cause the program to operate significantly slower. The shape of the filter can be used to control types of noise to remove. For example, a 3x3 or 5x5 boxcar can be used to remove speckle or salt and pepper noise. A 1 sample x 5 line boxcar with REPLACE=NULL could be used to remove dropped or noisy lines of data. Then use the lowpass program with a 3x3 boxcar to fill in the NULLed data. Valid minimum pixel value that will be used in boxcar computation. If a pixel value is less than LOW then it will not be used when computing boxcar statistics. Valid maximum pixel value that will be used in boxcar computation. If a pixel value is greater than HIGH then it will not be used when computing boxcar statistics. This is the minimum number of valid pixels which must occur inside the NxM boxcar for filtering to occur. For example, 3x5 boxcar has 15 pixels inside. If MINIMUM=10 then the filter will occur if there are 10 or greater valid pixels. A valid pixel is one that is not special (NULL, LIS, etc) and is in the range defined by LOW to HIGH. This option is used to define how NULL pixels are handled. If this parameter is set to TRUE, then NULL pixels will be considered to be noise and will be replaced. If FALSE, the NULL will be propagated to the output. This option is used to define how HIS (High Instrument Saturation) pixels are handled. If this parameter is set to TRUE, then HIS pixels will be considered to be noise and will be replaced. If FALSE, the HIS will be propagated to the output. This option is used to define how HRS (High Representation Saturation) pixels are handled. If this parameter is set to TRUE, then HRS pixels will be considered to be noise and will be replaced. If FALSE, the HRS will be propagated to the output. This option is used to define how LIS (Low Instrument Saturation) pixels are handled. If this parameter is set to TRUE, then LIS pixels will be considered to be noise and will be replaced. If FALSE, the LIS will be propagated to the output. This option is used to define how LRS (Low Representation Saturation) pixels are handled. If this parameter is set to TRUE, then LRS pixels will be considered to be noise and will be replaced. If FALSE, the LRS will be propagated to the output. 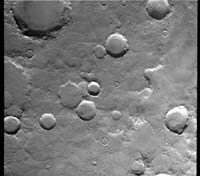 This is the input image f332s28.cub. It has noise in the form of small black rectangles. Output image showing results of a noise filter. 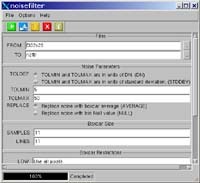 This is the output image for the noisefilter application. The black rectangles are gone.